The end of the year is just around the corner, and the last day of 2014 is approaching. Soon enough we will be saying hello to a brand new year, full of hope, expectations, and travels! For some, the night of 31st of December is just like any other night, for many it is a special and exciting night, for me… my favorite night of the year! Because I live in Munich I thought that one day I had to spend New Year’s Eve here and see how is it like. So after gathering a few friends at home for dinner, when midnight was approaching we all decided to head to the Olympia Park, where there is a hill from where it is possible to see the city from above. However, on New Year’s Eve it was very cold and foggy, which means we didn’t see almost anything, so I don’t advise you to spend there. In Munich there are other options of how to spend your New Year’s Eve. Apart from spending it at Marienplatz – where the City Hall is – along with thousands of other people, there are parties everywhere. If you decide for a party, make sure to make a reservation in advance. In terms of price, these parties can cost around 150 Euros per person, with everything included. One thing is certain: a New Year’s Eve in Munich will be cold! Would spend there again? No! I have to be honest. Stockholm is one of my favorite cities in the World, and after visiting it for the first time during the fall, I decided that one day I wanted to get back there in the next opportunity I had. So when deciding where to spend New Year’s Eve outside Germany and not paying a huge amount of money because of one special night, Stockholm was somehow the best option! W and me only decided what to do for New Year’s Eve after we got there. We were told that the most famous and popular place to go would be Skansen, an open-air museum at a park located in a hill with an amazing view to the city and the sea. And that is where we went! Every year since 1895 New Year’s Eve is celebrated at Skansen. There is always a concert with local bands – which were a bit boring for my taste – and small tents selling hot drinks and snacks, as well as a privileged view to the city. 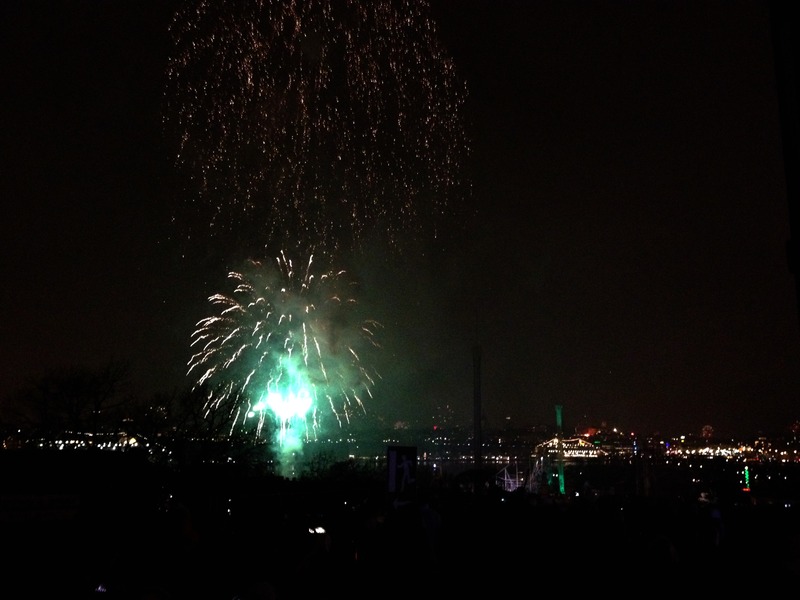 Spending New Year’s Eve at Skansen was indeed beautiful with all the amazing fireworks coming from the nearby boats and the old town – Gamla Stan – simply incredible despite the cold! Weather: cold… very cold and windy! Would spend there again? Not in Skansen, I think it is a one-time thing, but I would spend in Stockholm again and do something different. As selling alcohol in public in Sweden is a bit of a problem, there were no alcoholic beverages at Skansen, though you are allowed to bring yours. Just make sure you buy in advance because the liquor stores close early on the 31st. It was when I was living in Paris, and even though I knew I would spend New Year’s Eve alone in the city of lights, I had high expectations for this one. I decided to spend in the most obvious place: in front of the Eiffel Tower, at the Trocadéro. It was a bit cold and packed with people from everywhere in the World, most were in big groups or together as a couple, I was probably one of the few that were alone. 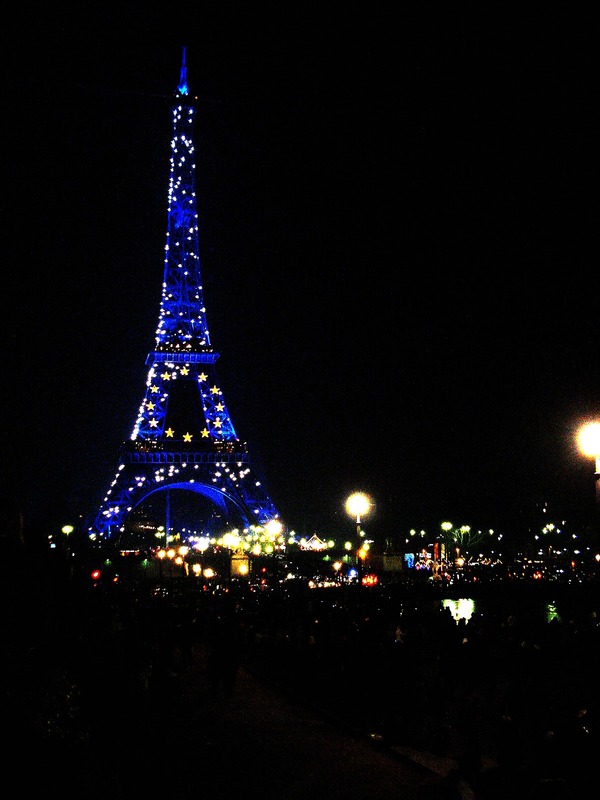 In 2008 the Eiffel Tower was in the European Union’s flag colors, all blue with gold stars. Each one of the stars would go dark in the last seconds before midnight, as a countdown, then the entire tower turned into a new color, which was very nice to see. Though, I have to say I expected more fireworks than they had, it looked beautiful anyways and I enjoyed my last day of the year alone, but surrounded by thousands of people. Leaving wasn’t the easiest task; the nearby metro station was closed so everyone had to walk a bit until the next opened station. The way back home was fun with some Spanish guys singing some of their funny New Year’s Eve’s songs in the metro, and everyone trying to sing along! Would spend there again? I think if would spend another New Year’s Eve in Paris I would go to the Champs Elysées next time to see how it is. Tip: Never spend a New Year’s Eve alone. New Year’s Eve in Madrid is a night to never forget. It is incredible that even with the cold – well, not that much if compared to the rest of Europe – people are cheering and singing and partying. 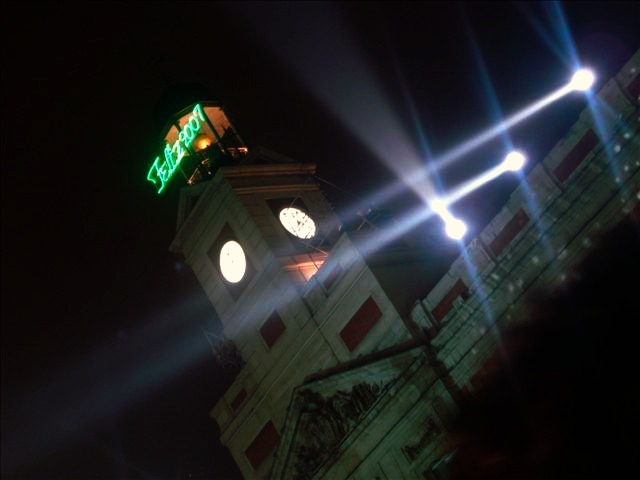 I spent midnight at the famous Puerta del Sol Square, where there is a countdown at the clock on the top of the Casa de Correos. The Spanish has a tradition of eating 12 grapes at each chime of the clock; that was fun! For a moment I thought I just couldn’t eat fast enough! Even though I was very sick of my stomach, it was impossible not to enjoy the most of the Noche vieja in Madrid. The crowd gathered at the Puerta del Sol Square was simply the best, not to mention eating the grapes in a hurry plus the fireworks! After midnight people would go to clubs around the city and party all night long; this option wasn’t possible for us, as my sis was underage. Next time! Weather: I didn’t think it as cold for a winter night, but Spain isn’t so cold as most European countries. Would spend there again? Definitely! Plus, add a little party after. Make sure you buy your grapes in advance, there are people selling at the Puerta del Sol too, though too pricey! Oh, and buy them seedless, it will make your life easier. Go for a nice dinner before and to a party afterwards! I think you might probably have figured out my favorite one among the four! 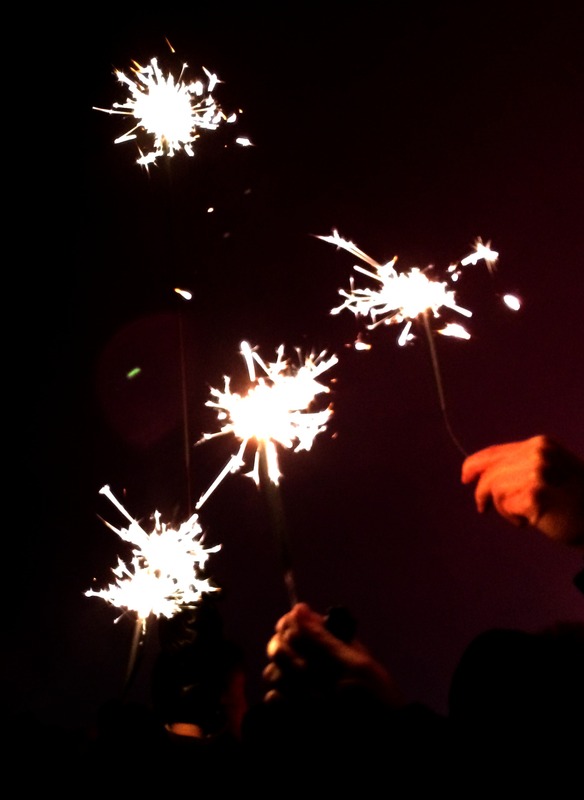 Have you spent New Year’s Eve in any of these cities? How was it? Are you going to spend it in any of them this year? Or where are you going? Thanks for the tips! By contrast, we’ve had some NYears where it was too hot to sleep. Much easier to enjoy the celebrations outside! It was lovely, we walked along the Danube with some champagne and had fun, I think literally everyone is out on the streets that night, haha! We have a tradition of spending every New Year in a different city and Paris was the worst! There were no fireworks the year we were there – but hundreds of police officers! 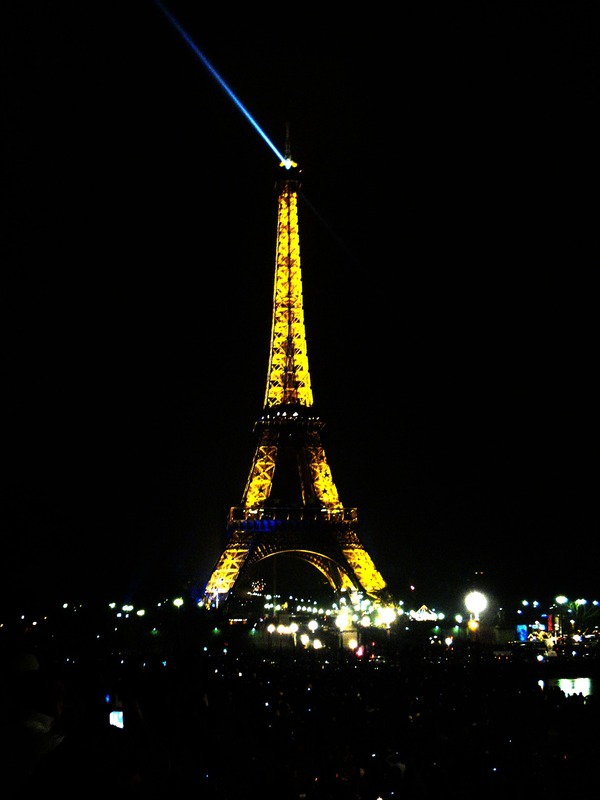 At midnight the Eiffel Tower sparkled in silver, the same as at every hour, then everybody just left. The best New Year is a tie between Brussels and Edinburgh. Brussels had an amazing fireworks display, and in Edinburgh there was so much to do, with live music, etc. Ohhh so I wasnt the only one who thought New Year’s Eve in Paris doesn’t have fireworks!! I was so disappointed with that 🙁 I don’t know why, they could make something amazing there!! And you are right, there were lots of policemen there!! Where are you spending this year? Wooow really?? I didn’t know New Year’s Eve in Moscow was such fun!! Now I am really curious! On my list definitely! Are there any traditions? I loved your little summaries and tips after each city – very cute! I’ll be home packing MY suitcase because I leave for Russia on January 2! Wooow, that sounds veeery exciting 😀 Where are you going in Russia? Mainly St. Petersburg. I may venture out into the countryside one day and then have a train ride to Tallinn, Estonia. Looking forward to it! I hope you have fun and tell us all about in your blog! We will be spending NYE in Toronto! Fireworks and the whole show, but with outdoor skating 🙂 Spain sounds like a blast! I hope you have fun at NYE, it really sounds like it will be! Yesss, Spain is so far my favorite one in Europe! Spending NY at the beach in hot weather sounds so amazing and surreal to me! I am used to cold weather and snow at that time of the year. We always go to a big organized party at a restaurant or banquet hall. It is a lot of fun and a lot of dances and I love dancing! Ohhh I know what you mean, on the other hand for me, it is weird to spend NYE in a cold country hahaa… I love spending on the beach with lots of fireworks and lots of friends and family 😀 I miss that! I have to manage to go again to Brazil for NYE one of these years! Do you know what are you doing this year? I’ve been in LA and Copenhagen for the most memorable ones. Need to step out and go somewhere new! It’ll be Santa Cruz California for me this year. Thank you so much for stopping by and for sharing your NYE plans! Oh the 12 grapes!! I do it every year since I’ve been with my husband. And yes BUY SEEDLESS ONES! the first year I did it, I picked all the seeds out and my sis in-law said I cheated! Haha!! The other place to go for New Year is Edinburgh! They have a huge Hogmanay street party! You are the second person who tells me Edinburg has a great NYE, I would never guess that! Its great to know!! This year I almost went to Madrid again, but it got expensive sooo fast that we gave up 🙁 but I really plan on going again! Are you spending your NYE in Bilbao? Yeah everything goes up in price in December it’s ridiculous! To be perfectly honest, I have never been into New Years Eve celebration too much. To me it’s just another day, but my husband and I, if we’re not with his family for Nocheveija, I will prepare a special quiet dinner for us. This year we will be here in Bilbao just the two of us. I’m usually falling asleep by 11pm haha!! I hope it helps 😀 You will love that city… but be prepared because it will be cold!! And thank you!! I thought it would be nice to share how different the four experiences were! 😀 Glad you liked it! I spent once in Canada, when I was living there!! I love Canada; consider myself psuedo-Canadian. But it is too cold to love and honestly, not much cheaper than the Bay Area. you mean “Winter-Peg”. lol. When Alberta thinks somewhere is cold, believe me, it’s really cold. Funny part is I have a guy in my gym from Winnipeg and they sure seem to be everywhere in the USA. I guess anythng warmer is good !! It’s always summer here in Australia for NYE. Last year I went to the city to watch the fireworks. There was so many people, so packed and in the end it took me 2 hours by foot to get home when it actually takes ten minutes 😀 That is probably my least favourite bit about NYE. Ohhh 2 hours?? That’s the thing about NYE, I guess everywhere people go on the streets and its all crowded!! Getting back home takes much longer the it normally does!! Are you spending in Melbourne this year? Are the fireworks already at 9pm? Wow!!!! I think this is such a good idea!!! 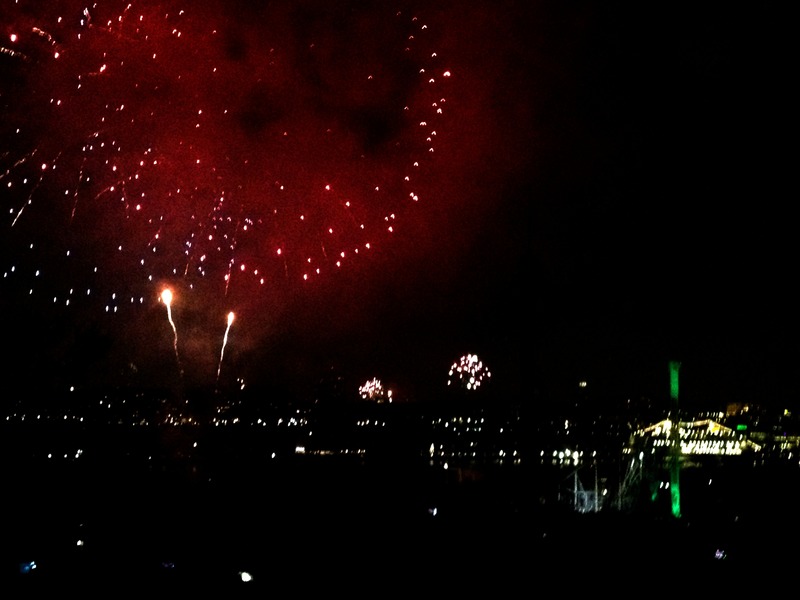 But there is nothing like that here in Germany nor in Brazil… its only the midnight fireworks. Though here in Germany on the 31st throughout the day there are many kids in the neighbourhood playing with some fireworks and their parents. But this year I chose to be somewhere calm, fireworks make Enzzo really scared, so we decided to spend NYE in the middle of nowhere in Italy 😀 lets see how that goes! What about you? Times Square? I hope to go to NY one day for NYE, but I believe only once, because Im sure its soooo cold and people have to wait sooo much! Ohhh yes, I hope next year will be London! But I know I have to plan in advance because its very expensive to spend NYE there!! I considered going this year, but it was a bit too late I guess! Ohh noo… take Monkey with you! What do you normally do on NYE? I party somewhere? This year it’s Dec 31st in Seoul! Can’t wait to discover Solar New Year’s here. Cold!! That’s how I think about spending NY eve in Europe…except maybe in Spain or Portugal 😀 but still… Great tips and experiences! Me too Indah… I really miss spending NYE in a warm country.. especially by the beach! Ohhhh diving on the first day of the year means starting your year with your right foot.. just amazing!! I wish we could do that, but everything at this time of the year is sooo expensive! To do that Im guessing we will have to plan in advance, and even so it will be expensive. New Year’s Eve in Paris is always fun, though cold. Depending on where you are in the city, the night can go very differently! New Year’s Eve in New York City is also amazing, with a lot of parties going on, and a huge party in Times Square. I can imagine!!! If I go again for a NYE in Paris, I try to go somewhere different and see how it is… I like fireworks, but I didnt see many in Paris. It used to be my tradition to spend Christmas and/or New Year’s in different countries, but I found travelling anywhere near Christmas and early January to be too expensive! So then it became my birthday tradition, in June. When I was younger it was more about where I was, but the older I got it became more about who I was with. I learned being with the “wrong” people can completely ruin the experience anywhere, but being with the “right” people can make anywhere a great experience. Ohhh alone in Time’s Square, just exactly like me in Paris!! I wouldn’t mind 😀 but Im sure it could have been better with some friends and all 😀 Thank you for sharing your experience! My best NYEs were also in small places, except for Madrid… the rest was always somewhere by the beach in Brazil, when I used to live there! I hope you enjoy your NYE this year 😀 and make the most out of it!! 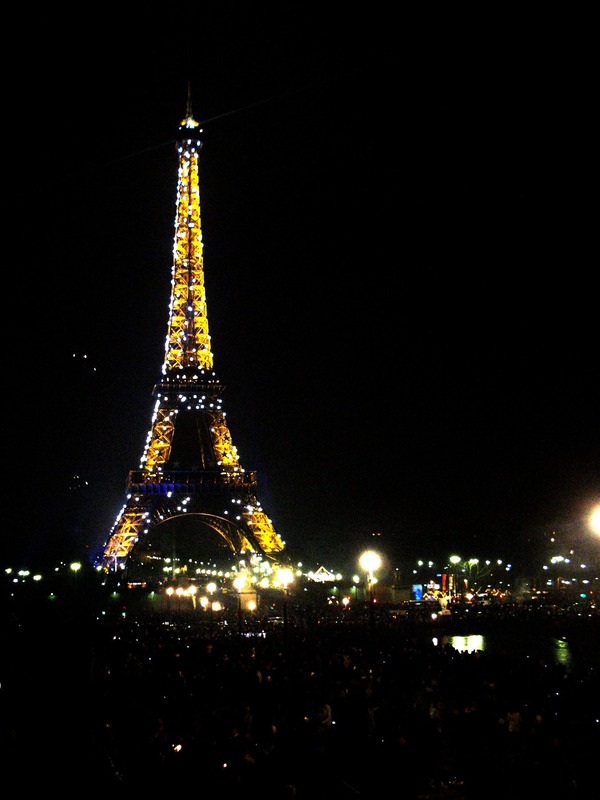 I would love to spend New Years Eve in Paris! For 2012 new years even my friends and I went to Paris, we were studying abroad in Lille. It was really a fun experience but I think I would never do it again. Too much harassment & nasty people for my taste plus people pushing around all the time. I had more fun on the bar we were before and after we left Trocadero. I’m definitely looking forward to Ljubljana this year! Hopefully it’s more peaceful. Yess exactly!! I also found it a bit too much… especially because I was alone! Great tips, wonderfully summarized…yes, each place has its own charm and character which get displayed during these high decibel celebration…yes, depends on how we would like to celebrate the arrival of the new year…once a while it is nice to spend a quite time with self when the world outside is in full celebration. This year my NYE will be very calm and relaxed with my husband and dog. How do you normally spend your NYE? Yes, its my favorite way of spending NYE!! Wow really? I didnt know that! What are you planning for this NYE? so cool that you got to experience four different types of new years!!! 😀 I always try to do something different on NYE, but so far here in Europe, Madrid is my favorite 😀 where are you spending NYE? Stockholm is pretty cold, hahaha. That sounds nice!! Do let me know!